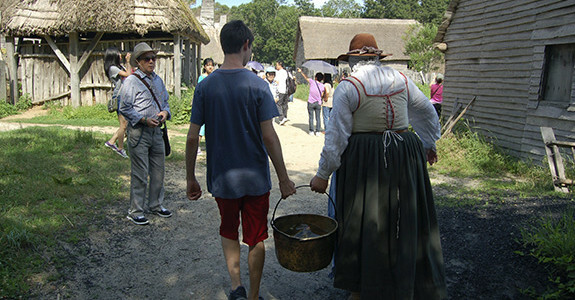 After seeing Plymouth Rock, head to the Plimoth Plantation and experience life as a Pilgrim. Living history museums are so fun because it's an experience and not just looking at displays. You get to take part and learn by participating. Learn about the Wampanoag tribe of Native Americans who lived side by side with the Pilgrims by visit ing a Wampanoag village with real descendants of the tribe who work here to preserve their tribal history. Amazingly, many of them are able to speak the Wampanoag language but they will speak to you in English, so ask lots of questions. Next visit the Pilgrim village. The “pilgrims” there will speak with you in the language they spoke on their arrival which is English but unlike the language we speak today. It was easy to see and feel how difficult their life was in the new land and how much they valued their freedom to put up with the risks of living in an strange and wild new land. The Pilgrims may enlist you to help them in the daily tasks-I wish my kids were that helpful at home. In the crafts pavilion we got to see Native American basket weaving, European lacemaking that is done by hand, furniture carving and pottery making-all crafts that the Pilgrims and the Wampanoag were able to do here . Before you leave check out the barn where they are raising "heirloom" species of goats, chickens, and cows-the animals that were native or were brought by the Pilgrims. Oh, and we learned here that the Thanksgiving feast probably didn’t happen-or at least not the way they teach it in school-kind of like finding out Santa Claus doesn’t exist.